Welcome to PHMSA's Pipeline Safety Research and Development Website. This site is dedicated to the coordination and dissemination of Research and Development information related to Pipeline Safety. PHMSA conducts and supports research to support regulatory and enforcement activities and to provide the technical and analytical foundation necessary for planning, evaluating, and implementing the pipeline safety program. PHMSA is sponsoring research and development projects focused on providing near-term solutions to help ensure the safe, reliable, and environmentally-sound operation of the Nation's pipeline system. 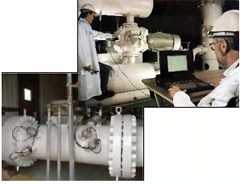 Recent R&D projects are focused on: leak detection; detection of mechanical damage; damage prevention; improved pipeline system controls, monitoring, and operations; and, improvements in pipeline materials. These projects are addressing technological solutions that can quickly be implemented to improve pipeline safety. In 2003, a study by the Government Accountability Office (GAO) found that the PHMSA Pipeline Safety R&D Program is aligned with PHMSA’s mission and pipeline safety goals.